Why can't your kids go to their local school Brunswick Secondary College. That is where you are zoned and you are entitled to go. Don't you know anything about schools? You are entitled to go to your local school. If you lived over Melville Rd your local school is Strathmore and your kids would be entitled to go there. 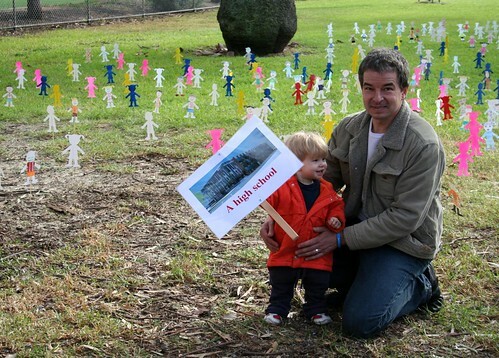 Darren's kids can't go to Brunswick Secondary College because they are outside the zone for that school. Same goes for Strathmore. Crazy, I know. That's why we need a high school in Coburg. Hi Anonymous, thanks for the comment. My oldest boy won't need a high school for 6 years and the biggest concern is that Brunswick is full now and has a cap on the number of students that can go there. It simply can't accomodate the numbers of children in the surrounding areas that need secondary education now and into the future. There are plenty of kids to go round and a new school would give everyone the opportunity to attend a local school with their friends and let parents get more involved with the local school as well. You are part of the Brunswick Secondary zone and since it is zoned, as the closest school as the crow flies, you will be in the zone in 6 years time. Or until another school is opened. Furthermore Brunswick will most likely increase in size in the next few years by possibly another 300 or so kids. I think you should correct your article to show your kids are eligible for Brunswick which is the truth. Currently you are telling an untruth. Janet you are wrong Jamieson St is clearly in the Brunswick zone and there are kids in Brunswick Secondary currently that live in Jamieson St.
Hi anonymous, thanks again for your comments. Do you want to let us know who you are and how you know there are kids in Jamieson Street that are at Brunswick Secondary please. As the crow flies, the nearest school to me is Moonee Ponds Central College so there is nothing untrue in what I have written. Brunswick is not my closest school and Brunswick will have no obligation to take my children. There is also forecast growth of around 700 children in Brunswick and Coburg alone with Brunswick Secondary College can not accomodate. Hi Darren your position is shared by many in the community. The lack of schools is a direct result of the fact we live in a super safe ALP seat. As someone who work is education research I am familiar with Stephen Lamb's work, and you have misrepresented his findings and current government policy. The link you make to government policy is spurious. The is no policy that compels students to travel to school, whatever is meant by that. Lamb, through a number of research reports, has essentially argued that changes government education policy (both State and Commonwealth) over the last 25 years has resulted in the under-resourcing of schools in low SES areas. Students, for a variety of reasons, have drifted to schools in higher SES areas. As funding follows the student, this constrains the capacity of a low SES school to offer a breadth of curriculum and program options to students. To address this situation, Lamb argues for additional funding in disadvantaged schools to improve learning and retain high performing students. Lamb's argument is that schools should have appropriate cultural, educational and financial resources. One of the important factors that improves a school's performance is the presence of high-achieving students, who are more likely to come from middle to high SES families. This is a very strong finding in the research on school performance. Students from Coburg are able to go to either Brunswick SC, Fawkner SC, William Ruthven SC, Box Forest SC and other secondary schools nearby if they have the capacity. There are schools available, some of which would experience markedly better outcomes if students from middle class families went there. I can't help but wonder if the HSC agenda isn't driven by the self-interest and the aspirations of those involved rather than an interest in benefitting the broader community. Hi Anonymous, can u please identify yourself with your full name and the suburb where u reside please? I am David Nunns and i live in Coburg West (where i was once in the zone to get kids into Strathmore SC but lost that when the boundaries changed from Sydney Rd to Melville Rd) Last year my son (in Grade 4) got a promotional flyer from Parade College in Bundoora - that is just a ridiculous proposition in terms of travel time (18 plus kilometres) and one of the dozens of reasons why we need a High School for Coburg. Hi Anonymous, one more thing (to quote Colombo) Can u please refer me to where i can find the boundaries for the so-called Brunswick SC "Enrolment Zone" - there is no map of it on the schools website nor is it in the 2009 Annual Report. There is most certainly an "Enrolment Ceiling" but NO GEOGRAPHIC ZONE according to documentation from the Department of Education. Basic facts will help the debate - not false statements. Please identify yourself when making negative comment so we can tell whether it is genuine community comment or has a specific political link. Anonymous, HSC applauds the work being done on Glenroy and John Fawkner but your aim should be to get those communities to support these schools notto rely on faraway suburbs to plug the gaps. Schools to the South are full. As you probably know -a report coming out will clearly show no evidence of South- North travel to secondary school ie. it does not happen and it cannot be made to happen. This is supported by Stephen Lamb's work on the Northern Region which shows that students do not travel away from their area to a lower SES area. For any rational discussion of the issue the DEECD havae to accept that fact. "Those involved" that anonymous talks about are the 1500 on HSC contact list, 321 on facebook so far, the numerous schools, community groups, Moreland Council and politicians etc who have written letters of support. The broad community wants this as evidenced by the latest 2010 Moreland Community Indicators Survey –the percentage agreeing to statement “There are good quality government secondary schools in your area’ -in Coburg only 39% agree and in Coburg North - an extremely low 19% agree. We want this for the benefit of the whole community as anyone familar with our argument knows. High School for Coburg's surevy of 265 respondents showed the main issues are COMMUNITY and DISTANCE not class/race. It is pathetic that the DEECD Northern Region "push back" with unfounded propaganda about snobbery (We now have four reports of this from people who work with them). We have the right to be part of building this community around a local high school and to be in the "partnership" trumpeted in DEECD and govt policy. This Family-School-Community partnership is crucial for outcomes and is of most benefit to disadvantaged kids at risk of disengagement. This partnership cannot occur readily if school is faraway. The group most at risk are early secondary age boys - the specific group with no state secondary provision in this area. And no I don't have a son. Generally the way to work out school zones is to use the Melways and a piece of string. The boundary is the mid-point between the two schools. You don't have to worry about not being in the zone for any school. It doesn't work like that. Usually, you will be in the zone for your nearest school. A lot of kids get into schools from outside their zones too. I'm sure you could check if Jamieson St is in the Brunswick zone by contacting the school or the education department, if you want to be sure.